With five mini screwdrivers, this colorful, fun set is a must have for any home or office. 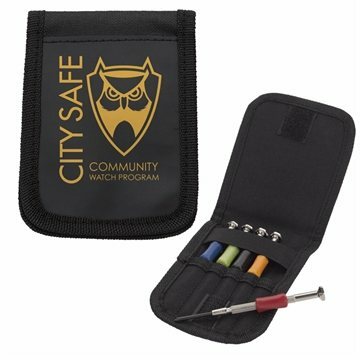 The small tools are ideal for opening battery compartments, or working on small electronics. Colored handles for easy identification. Convenient, stylish case keeps tools together. We purchased these like a giveaway at our Annual Conference. Customer service is fantastic. I have passed all AnyPromo contact information to our Administrative Assistant for our future company needs. We were able to receive samples before we ordered our products. We were more than pleased with the quality of the print work and the quality of the products. Absolutely beautiful !!!!!!!!!!!!! Everybody was very please to get this gift. the prices reasonable, shipping received within days, representatives very professional. I have recommended AnyPromo to family, friends, and coworkers that has seen your product and was impressed. They more than met our anticipation.